Here is the list of the hotels near Sembleçay. Book your hotel near Sembleçay today, Tuesday 14 May for the best price, reservation and cancellation free of charge thanks to our partner Booking.com, leader in on-line hotels reservation. Below here is the list the 50 closest hotels of Sembleçay, sortable according your criteria. You will find the position of these accommodations on the Semblecay hotels map. Surrounded by a 2-hectare park with a private pond, this 17th-century farm has been converted into a B&B. Providing free private parking, it also offers refined rooms with stone walls and exposed beams. An LCD TV, DVD player and CD player are provided in all of the rooms at La Touche. They offer views of the countryside and some also have free Wi-Fi internet access. A continental and American breakfast is served daily near the fireplace. During warmer months you can also enjoy it in the garden. Local specialties are also proposed upon reservation and at an additional cost. Located 3 km from Chabris, La Touche is a 10-minute drive from Valençay Castle and 30 km from the Beauval Zoo. Situated in Dun-le-Poëlier, Chateau de Fins provides accommodation with free WiFi and access to a garden. There is an on-site restaurant, which serves French cuisine. The bed and breakfast offers a seasonal outdoor pool. Guests can also relax in the shared lounge area. Vierzon is 39 km from Chateau de Fins, while Saint-Aignan is 45 km from the property. The nearest airport is Chateauroux-Centre Airport, 53 km from the accommodation. Guest accommodation La Vernelle Preferred hotel ! Gite La Vernelle is a semi-detached holiday home with a garden, situated in La Vernelle. The property is 44 km from Blois and free private parking is provided. Free WiFi is available. The kitchen features a dishwasher. A flat-screen TV is featured. There is a shared bathroom with a bath or shower. Châteauroux is 47 km from Gite La Vernelle, while Vierzon is 37 km away. Beauval Zoo is 25 km away and Tours Val de Loire Airport is 69 km from the property. Set in Jaugy, in the Centre Region, 3 km from the centre of Gièvres, 5 km from Villefranche-sur-Cher and a 35-minute drive from Beauval Zoo, Ka-lys features a terrace and views of the garden. Free WiFi is featured and free private parking is available on site. A kettle can be provided upon request. The rooms have a shared bathroom. Vierzon is 30 km from Ka-lys, while Blois is 50 km away. The nearest airport is Tours Loire Valley Airport, 93 km from Ka-lys. Guest accommodation Poulaines Preferred hotel ! Domaine de Poulaines isa manor house located in Poulaines, a 35-minute's drive from Beauval Zoo. Guests staying at the property have free access to the botanical garden of Poulaines. Free WiFi, a tennis court and a children's playground are provided. The accommodation offers a private garden area and a dining area. A flat-screen TV and DVD player are available. There is also a kitchen, fitted with a dishwasher. A microwave, a toaster and fridge are also offered, as well as a coffee machine and a kettle. Each unit is fitted with a private bathroom with bathrobes and a hairdryer. Towels are available. Guests can enjoy various activities in the surroundings, including cycling and hiking. The Beauval Zoo is 31 km away while the National Shooting Sports Centre is 47 km from the property. Vierzon is 42 km from the property. The nearest airport is Chateauroux-Centre Airport, 42 km from the property. Set in the heart of the Val de Loire region, this countryside hotel offers soundproofed accommodation overlooking the large garden. It also has an outdoor terrace and a children’s playground. All of the rooms at the Hotel Le Grand Chêne are equipped with a TV and a telephone. They each have a private bathroom with bathtub or shower. Free WiFi access is available throughout the entire hotel. Le Grand Chêne provides a continental breakfast every morning. Children under the age of 6 can have the breakfast for free and children between 6 and 11 years old can have the breakfast for a reduced price. There is a grill restaurant across the street from the hotel and many other restaurants can be found in the surrounding. Romorantin and Selles-Sur-Cher are just a 10-minute drive away, Beauval Park is a 20-minute drive and the A85 motorway is a 7-minute drive away. Free private parking is possible on site. Guest accommodation Selles-sur-Cher Preferred hotel ! Featuring free WiFi throughout the property, Domaine des Nouies offers accommodation in Gièvres, 24 km from Beauval Zoo. Free private parking is available on site. Every room includes a flat-screen TV with satellite channels and DVD player. Some rooms have a seating area for your convenience. You will find a coffee machine in the room. Rooms have a private bathroom. For your comfort, you will find free toiletries and a hairdryer. A range of activities are offered in the area, such as fishing and hiking. Chambord is 47 km from the property. The nearest airport is Chateauroux-Centre Airport, 60 km from Domaine des Nouies. Located in Gièvres, Le Champ du Pré features barbecue facilities and a garden. With free WiFi, this 3-star guest house offers a shared kitchen. The guest house provides garden views and a terrace. All guest rooms in the guest house are fitted with a kettle. The private bathroom is equipped with a shower, free toiletries and a hair dryer. All rooms have a wardrobe. A continental breakfast is served every morning at the property. Guests can take part in various activities in the surroundings, including cycling and fishing. Blois is 45 km from Le Champ du Pré. The nearest airport is Chateauroux-Centre Airport, 68 km from the accommodation. Set 24 km from Beauval Zoo, La Grille du Parc (The Gate House) is a holiday home in Selles-sur-Cher with access to free bikes. The property is 40 km from Blois and free private parking is offered. With direct access to a terrace with garden views, the holiday home consists of 2 bedrooms and a fully equipped kitchen. A flat-screen TV with satellite channels and a Blu-ray player are available. The holiday home offers a barbecue. Guests can relax in the garden at the property. Amboise is 49 km from La Grille du Parc (The Gate House). Chateauroux-Centre Airport is 48 km away. "le clos de la Jacquiere" is located in Selles-sur-Cher and offers a seasonal outdoor swimming pool, barbecue facilities and a garden. The property was built in 18th century, and has accommodation with free WiFi. This holiday home is fitted with 1 bedroom, a cable flat-screen TV, a dining area, a kitchen and a living room. The holiday home also provides a seating area, washing machine and 1 bathroom with free toiletries. The holiday home offers a terrace. Hiking can be enjoyed nearby. Blois is 45 km from "le clos de la Jacquiere", while Vierzon is 49 km from the property. The nearest airport is Chateauroux-Centre Airport, 72 km from the accommodation. Set in Selles-sur-Cher, Holiday home R.de Lavoir, Saugirard features a private pool. Guests staying at this holiday home have access to a fully equipped kitchen. The holiday home is fitted with a TV, 1 bedroom and a living room. The holiday home offers an outdoor pool. Blois is 45 km from Holiday home R.de Lavoir, Saugirard, while Vierzon is 49 km away. The nearest airport is Chateauroux-Centre Airport, 72 km from the accommodation. Set in Villefranche-Sur-Cher, 47 km from Blois, La Petite Tuilerie features free WiFi access and free private parking. The rooms are equipped with a flat-screen TV. You will find a kettle in the room. For your comfort, you will find free toiletries and a hairdryer. Vierzon is 23 km from La Petite Tuilerie, while Saint-Aignan is 31 km from the property. The nearest airport is Chateauroux-Centre Airport, 48 km from La Petite Tuilerie. Les charmes is situated in Valençay. The property features garden views and is 500 metres from Chateau de Valencay. The bed and breakfast comes with a flat-screen TV and a living room. The property also has 1 bathroom with a shower. A continental breakfast is available each morning at the bed and breakfast. Les charmes offers a terrace. Guests can relax in the garden at the property. The nearest airport is Chateauroux-Centre Airport, 44 km from the accommodation. Le Relais Du Moulin is located in Valencay, close to the Nahon River and features comfortable and affordable accommodation. Guestrooms are cosy and spacious and offer different views of the surrounding area including Talleyrand Castle, the river and the surrounding vineyards. All of the rooms are equipped with modern en suite facilities and Wi-Fi internet access is available in the hotel’s public areas and is free of charge. Enjoy high-quality traditional and regional cuisine in Le Jacques Coeur, the hotel’s restaurant. It is open for lunch and dinner daily. Breakfast is also served daily in the hotel. Also, be sure to profit from the swimming pool, hot tub, sauna and fitness room for a workout or a moment of relaxation. Situated in Pruniers in the Centre region, 29 km from Beauval Zoo, Gite au Coeur de la Sologne is a holiday home featuring a terrace and garden views. This holiday home features barbecue facilities as well as a garden. The holiday home boasts a flat-screen TV, a well-equipped kitchen with a dishwasher and a bathroom with a bath. Free private parking is available at Gite au Coeur de la Sologne. Blois is 39 km from the accommodation. The nearest airport is Chateauroux-Centre Airport, 51 km from the property. Situated in Valençay with Chateau de Valencay nearby, Villa Da Vinci offers accommodation with free WiFi. There is a fully equipped private bathroom with shower and a hair dryer. A continental breakfast is served every morning at the property. The bed and breakfast offers a terrace. Guests can also relax in the garden. The nearest airport is Chateauroux-Centre Airport, 45 km from the property. Offering free WiFi and pool views, Les Brandes is an accommodation located in Lignac. The property has garden views and is 42 km from Châteauroux. The holiday home includes a kitchen with a dishwasher and an oven, as well as a coffee machine. A TV is provided. Vierzon is 38 km from the holiday home. The nearest airport is Chateauroux-Centre Airport, 45 km from the property. Set in Selles-sur-Cher, Le Lion d'Or features a terrace and bar. Both free WiFi and private parking are accessible at this property. At the hotel, every room comes with a wardrobe. Featuring a private bathroom, rooms at Le Lion d'Or also provide guests with a garden view. All units in the accommodation are fitted with a flat-screen TV and free toiletries. Guests at Le Lion d'Or can enjoy a continental breakfast. There is an in-house restaurant, which specialises in European cuisine. Blois is 41 km from the hotel, while Saint-Aignan is 16 km away. The nearest airport is Chateauroux-Centre Airport, 59 km from Le Lion d'Or. La Maison De La Rive Gauche offers accommodation with a garden and free WiFi, and is located in Selles-sur-Cher. The bed and breakfast offers a continental or buffet breakfast. Blois is 41 km from La Maison De La Rive Gauche, while Saint-Aignan is 16 km away. The nearest airport is Chateauroux-Centre Airport, 59 km from the property. Bed and Breakfast Selles-sur-Cher Preferred hotel ! La Pecherie is set in Selles-sur-Cher, 300 metres from the city castle, and features a garden. The property provides a terrace, as well as a shared lounge. Every room is equipped with a terrace with a garden view. La Pecherie is 19 km from Beauval Zoo. All guest rooms in the bed and breakfast are fitted with a kettle. With a private bathroom, rooms at La Pecherie also offer free WiFi, while selected rooms here will provide you with a city view. All units have a wardrobe. A continental breakfast is served daily at the property. Chenonceau and Chambord Castles are both 42 km away. The area is popular for walking along the Cher River bank, which is 150 metres from the property. Blois is 38 km from the accommodation. Chateauroux-Centre Airport is 48 km away. Set in Valençay, Le Camp du Chevalier is 1.1 km from Chateau de Valencay and 24 km from Beauval Zoo. Free private parking is available on site. All units have a seating and dining area. Shared bathroom facilities and a shared kitchen area with an oven, a fridge and a washing machine are also at guests' disposal. Breakfast can be delivered daily upon request and at a surcharge. Le Camp du Chevalier also includes a barbecue. A range of activities are offered in the area, such as water sports, fishing, hiking and horse riding. The nearest airport is Chateauroux-Centre Airport, 34 km from the property. The ibis Budget Romorantin is located just 1 km from the A85 motorway and 3 km from the centre of Romorantin. It has a 24-hour reception and free, unlimited Wi-Fi is provided in the air-conditioned rooms. A flat-screen TV with satellite channels features in the guest rooms, which have a contemporary decoration. Each room is non-smoking and the en suite bathrooms are all fitted with a shower. A buffet-style breakfast is served every morning at ibis Budget Romorantin. Free private parking is available on site and Château de Cheverny is 29 km away. Château de Chambord is 40 km from the property and Chateau de Chenonceau is less than 60 km away. Beauval Zoo is reached by car in 35 minutes. Set only 3.4 km from Parc de Beauvais and 33.5 km from Beauval Zoo, Le mur des beaunes is a holiday home in a prime location in Romorantin. Complimentary private parking is available on site. The holiday home has a flat-screen TV. The kitchen comes with a dishwasher and an oven. There is a garden at this property and guests can go canoeing and hiking nearby. The nearest airport is Chateauroux-Centre Airport, 53 km from the property. Featuring accommodation with a terrace, La "Solognote" près de Beauval is set in Billy. This property offers access to free WiFi. This 4-bedroom holiday home comes with a kitchen, a seating area, a dining area and a flat-screen TV. The holiday home also features 1 bathroom with a bath. The holiday home offers a barbecue. Guests at La "Solognote" près de Beauval can enjoy cycling nearby, or make the most of the garden. Blois is 39 km from the accommodation, while Saint-Aignan is 15 km away. Chateauroux-Centre Airport is 62 km from the property. Situated in Romorantin, 4.1 km from Parc de Beauvais, La maison des canards features a living room with a flat-screen TV. The property has garden views. The holiday home has 1 separate bedroom and includes a kitchen with a dishwasher, oven and dining area. The holiday home offers a terrace. Guests can also relax in the garden. The nearest airport is Chateauroux-Centre Airport, 98 km from La maison des canards. Situated in Meusnes, La Métairie du Moulin de Meusnes features accommodation with a terrace and free WiFi. This holiday home has a garden and barbecue facilities. The holiday home is fitted with 5 bedrooms, a kitchen with a dishwasher, and 2 bathrooms. A flat-screen TV with satellite channels is featured. The holiday home offers a children's playground. If you would like to discover the area, fishing is possible in the surroundings. Blois is 48 km from La Métairie du Moulin de Meusnes, while Amboise is 48 km away. Chateauroux-Centre Airport is 60 km from the property. Situated in Mennetou-sur-Cher in the Centre Region, this semi-detached holiday home is 45 km from Bourges. The unit is 16 km from Vierzon. Free WiFi is offered throughout the property. There is a seating area and a kitchen equipped with an oven. Towels and bed linen are provided at Le Meublé MONESTOIS. You can play tennis at the property, and the area is popular for cycling. Saint-Aignan is 37 km from Le Meublé MONESTOIS, while Lamotte-Beuvron is 39 km away. A selection of activities are offered in the area, such as fishing and hiking. The nearest airport is Tours Loire Valley Airport, 88 km from Le Meublé MONESTOIS. Featuring barbecue facilities, Gîte La Maison du Moulin de Sologne offers accommodation in Pruniers with access to free WiFi and river views. Guests staying at this holiday home have access to a fully equipped kitchen and a terrace. Providing access to a balcony, this holiday home comes with 5 separate bedrooms. A flat-screen TV is featured. The holiday home offers a sun terrace. Fishing can be enjoyed nearby. Beauval Zoo is 35 km from the property and Blois is 44 km from Gîte La Maison du Moulin de Sologne. The nearest airport is Chateauroux-Centre Airport, 54 km from the property. Hotel Romorantin Preferred hotel ! Set 35 km from Beauval Zoo, Astrotel is situated in Romorantin. With free WiFi, this 2-star hotel offers a bar and a garden. The restaurant serves French dishes. All guest rooms in the hotel are equipped with a TV. The rooms are equipped with a private bathroom. A buffet, gluten-free or continental breakfast is available every morning at the property. Astrotel offers a sun terrace. Hiking is among the activities that guests can enjoy near the accommodation. Speaking English,and French at the 24-hour front desk, staff are always on hand to help. Parc de Beauvais is a 14-minute walk from Astrotel. The nearest airport is Chateauroux-Centre Airport, 54 km from the property. Set in a central area of Romorantin, la dabinerie provides accommodation with garden views, just 1.9 km from Parc de Beauvais. Guests staying at this homestay have access to a terrace. The homestay offers a sun terrace. Guests can also relax in the garden. Chateauroux-Centre Airport is 55 km away. La Dabinerie is 35 km from Beauval Zoo. Pastelle is a B&B situated in Billy, 34 km from Blois. Free WiFi is available and free private parking is available on site. Beauval Zoo can be found 19 km away while Chambord Castle is located 37 km far from the property. There is a shared bathroom at Pastelle. Guests will also enjoy free access to a shared lounge. Amboise is 43 km from pastelle, while Vierzon is 42 km away. The nearest airport is Chateauroux-Centre Airport, 52 km from the property. Boasting garden views, Chambre avec véranda is located in Romorantin, around 1 km from Parc de Beauvais. This bed and breakfast provides barbecue facilities. With free WiFi, this bed and breakfast features a flat-screen TV and a kitchen with dishwasher. A buffet breakfast is available each morning at the bed and breakfast. Chambre avec véranda offers a terrace. Guests can relax in the garden at the property. The nearest airport is Chateauroux-Centre Airport, 97 km from the property. Located in Langon, Domaine de la Gaucherie is set on a farm with different animals such as ponies, geese, sheep and donkeys as well as a heated outdoor swimming pool and fishing pond. Vierzon is a 30-minute drive away. All rooms and suites are spacious and feature a private bathroom including a shower, toilet and hairdryer, while one also has a spa bath. A continental breakfast is provided each morning at Domaine de la Gaucherie. Guests can also enjoy homemade meals prepared by the hosts, upon request and at an extra cost. Additional features include a shared TV lounge, free Wi-Fi access in the public areas and free private parking on site. Romorantin-Lanthenay is a 10-minute drive away and the Loire Castles are under and hour’s drive from the property. Featuring a garden, Les Fontenils offers accommodation in Lassay-sur-Croisne with free WiFi and garden views. This bed and breakfast provides accommodation with a terrace. The bed and breakfast has a flat-screen TV. A continental or gluten-free breakfast is available daily at the property. Blois is 37 km from the bed and breakfast. Tours Loire Valley Airport is 96 km from the property. Boasting a garden and a shared lounge, Éthic Étapes Jean Monnet is set in Romorantin and is less than 1 km from Parc de Beauvais. Providing a restaurant, the property also has a bar. Both free WiFi and private parking are accessible at this property. At the hotel, each room has a desk. Each room comes with a private bathroom. All rooms include a wardrobe. A buffet breakfast can be enjoyed at the property. Éthic Étapes Jean Monnet offers a sun terrace. You can play table tennis at the accommodation. The nearest airport is Chateauroux-Centre Airport, 97 km from Éthic Étapes Jean Monnet. Located in Romorantin-Lanthenay, Domitys Le Jardin des Trois Rois offers an indoor swimming pool, fitness centre and a games room. The train station is only 1.6 km away and the Sologne Museum is a 5-minute drive from this senior residence. The apartment features a living area with a flat-screen TV, a wardrobe and a bathroom with a hairdryer and free toiletries. The kitchen includes a microwave, stovetop and refrigerator. Additional features include a terrace, garden and shared TV lounge with Wi-Fi access. Beauty services are available on Tuesday mornings and a hairdresser is on site every Monday afternoon and Friday morning. This property is 37 km from the famous Beauval Zoo. Vierzon is a 30-minute drive away and free private parking is possible on site. Featuring free WiFi throughout the property, La Tour aux grains offers accommodation in Romorantin city centre, 200 metres from Parc de Beauvais. Housed in a former granary, this property offers a spiral staircase designed by Leonardo Da Vinci and guest rooms fitted with a private bathroom. For your comfort, you will find free toiletries and a hairdryer. There is a shared kitchen at the property. Guests have access to shared lounge with a flat-screen TV. The nearest airport is Chateauroux-Centre Airport, 55 km from La Tour aux grains. Two-Bedroom Holiday Home in Lye is situated in Lye. The holiday home offers an outdoor pool and free WiFi. This holiday home has 2 bedrooms, a living room and a fully equipped kitchen with a dishwasher and an oven. A TV is available. Blois is 48 km from Two-Bedroom Holiday Home in Lye, while Amboise is 47 km away. The nearest airport is Chateauroux-Centre Airport, 58 km from the accommodation. Offering free WiFi and a seasonal outdoor swimming pool, les Thiausères offers accommodation in Romorantin, a 7-minute walk from Parc de Beauvais. Featuring a shared kitchen, this property also provides guests with a sun terrace. Guests can make use of a shared lounge. At the bed and breakfast, rooms come with a wardrobe. Some rooms share a bathroom and toilet with one other room, whilst the suite has a private bathroom and toilet. A continental breakfast is served daily at the property. The nearest airport is Chateauroux-Centre Airport, 55 km from les Thiausères. Le Grand Hôtel du Lion d'Or is located in the centre of Romorantin-Lanthenay. It is a Renaissance-style manor house with a Michelin-star restaurant and a terrace with views of the garden. The rooms and suites at Le Grand Hôtel du Lion d'Or are decorated in a contemporary style. All feature a minibar, free Wi-Fi and air conditioning, while some also have a private balcony. A continental breakfast is available every morning either in the dining room or in the comfort of guest rooms. You can also choose to have a drink in the bar before sampling gastronomic-style cuisine in the restaurant. Private parking is possible with an extra cost and the A85 motorway is just a 6-minute drive away. Other local attractions include Cheverny Castle and Beauval Zoo, both a 35-minute drive from the hotel. Featuring barbecue facilities, a garden as well as a terrace, La fabrique is set in Romorantin, within less than 1 km of Parc de Beauvais. Complimentary WiFi is provided. Each unit comes with a sofa, a seating area, a flat-screen TV, a well-fitted kitchen, and a private bathroom with a hair dryer. A dishwasher and oven are also available, as well as a coffee machine and a kettle. Chateauroux-Centre Airport is 98 km from the property. La Colardine is set in Châtillon-sur-Cher and offers a garden and a terrace. Guests staying at this holiday home have access to free WiFi and a fully equipped kitchen. The holiday home offers a children's playground. Blois is 44 km from La Colardine, while Amboise is 46 km from the property. Chateauroux-Centre Airport is 67 km away. Hôtel la Pyramide is located in Romorantin, a 30-minute drive from Beauval Zoo Park. The hotel offers a gourmet-style, French restaurant with an extensive wine list and a terrace. You can enjoy a cocktail at the bar on site. Each uniquely-decorated room is equipped with a flat-screen TV and free Wi-Fi access. All of the rooms have a private bathroom. The restaurant on site serves traditional dishes such as foie gras or salmon tartar. A buffet breakfast is available every morning. At Hôtel la Pyramide you will find a 24-hour front desk and newspapers are available. You can also use the safety deposit box, here at your disposal. The hotel is 900 metres from Parc de Beauvais. Tours Loire Valley Airport is 77 km away and the property offers free, secured parking. Set in Couffy, just 11 km from Beauval Zoo, this apartment features a terrace. The unit is 40 km from Blois. Free private parking is available on site. There is a seating area and a kitchenette complete with an oven and a microwave. A flat-screen TV and DVD player, as well as a CD player are featured. Gite de Poulas features free WiFi throughout the property. Amboise is 41 km from Gite de Poulas, while Vierzon is 46 km away. Chateauroux-Centre Airport is 47 km from the property. 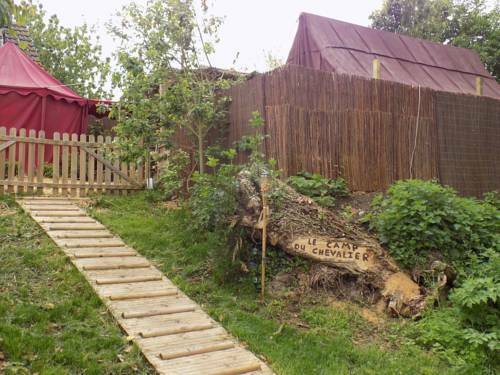 Les 3 Provinces is situated in Couffy, 11 km from Beauval Zoo and 40 km from Blois. Free private parking is available on site. All rooms have a private bathroom equipped with a bath or shower. The area is popular for cycling and hiking. Amboise is 41 km from Les 3 Provinces, while Vierzon is 46 km away. The nearest airport is Chateauroux-Centre Airport, 47 km from Les 3 Provinces. Featuring a terrace and free WiFi, Chambres d'hôtes Châtres-Sur-Cher provides accommodation in Châtres-sur-Cher. There is a fully equipped private bathroom with shower and free toiletries. A continental breakfast is served each morning at the property. Vierzon is 14 km from the bed and breakfast, while Saint-Aignan is 43 km from the property. The nearest airport is Chateauroux-Centre Airport, 74 km from Chambres d'hôtes Châtres-Sur-Cher. Guest accommodation Châtillon-sur-Cher Preferred hotel ! Maison Coeur Nature is a detached holiday home located in Châtillon-sur-Cher and featuring a 1500 m² garden with a barbecue just 9 km from Beauval Zoo. Free private parking is available on site. The holiday home has a living room with a fireplace and a flat-screen TV. The kitchen comes with an oven, a dishwasher, a microwave and a coffee machine. A washing machine is also at guests' disposal. Games and books for children are available. You can play table tennis at the property, and the area is popular for cycling and fishing. Château de Cheverny is 28 minutes' drive from the property. Restaurants and shops can be reached 24 minutes' drive in Romarantin-Lathenay. Blois is 44 km from Maison Coeur Nature and the nearest airport is Tours Loire Valley Airport, 59 km away. Bed and Breakfast Lassay-sur-Croisne Preferred hotel ! Featuring free WiFi and an outdoor pool, Chambre d’hotes Le Grand Fourneau offers bed and breakfast accommodation in Lassay-sur-Croisne, 32 km from Blois and 33 k from Beauval Zoo. Free private parking and air-conditioning are provided on site. Views of the lake, heated pool or garden are featured in certain rooms. For your comfort, you will find free toiletries and a hair dryer. A continental breakfast is served every morning upon request. There is a shared lounge at the property. Pets are accepted in some rooms. A range of activities is offered in the area, such as fishing and hiking. Amboise is 49 km from Chambre d’hotes Le Grand Fourneau, while Beauval Zoo is 34 km from the property. The nearest airport is Tours Val de Loire Airport, 69 km from Le Grand Fourneau. Situated in Lye, les huberts offers accommodation with a terrace and free WiFi. The property has garden views. This holiday home is fitted with 3 bedrooms and 3 bathrooms equipped with a shower and a hair dryer. There is a seating area, a dining area and a kitchen complete with a dishwasher, an oven and a microwave. The holiday home offers a barbecue. Guests can also relax in the shared lounge area. Blois is 47 km from les huberts, while Amboise is 45 km away. The nearest airport is Chateauroux-Centre Airport, 61 km from the accommodation. Below here is the hotels map of Sembleçay. Names and details of Sembleçay hotels can be shown on the map clicking on the prices icons.